Organisation: the site went live in 2008 with 1,200 singles listed spread across more than 300 labels (There are now more than 7,600 singles and over 650 labels). The site is arranged primarily by label, although there is also a band index to help people navigate their way around. Bands changed name and splintered with such frequency that my own ignorance has made it difficult to build up timelines for groups’ different incarnations, so the band index requires refinement. Click on the links at the top of each page to navigate around the site. This is the first website I have built, so if things don’t work, let me know. Blog: Check here for details of new additions, updates and news. Pictures: many of the images have come from Ebay screen grabs and are less than clear. If you have better pictures of labels or images of labels that are currently picture-less please send them in. 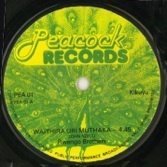 Credits: this project wouldn’t have been possible without the assistance of crate-digger supreme Cheeku Bidani and John Beadle, creator of the wonderful Likembe blog, who both opened their files to me with unstinting generosity, Alastair Johnston of Muzikifan and Doug Paterson, whose deep fund of knowledge you can access via the East African Music Page link to the left, didn’t hesitate in giving me permission to lift large chunks of their own research for which I am eternally grateful. Didier of the Mwanasimba website allowed me to pick his brains and use his images, Wuod Kwatch has offered help with Dholuo and reassurance throughout, Andy and Adam at Eldica in Bradbury St, London E8, a goldmine for lovers of rare and funky vinyl from around the planet, have generously allowed me to use their scans. 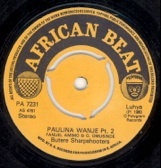 Finally, this all started when I posted a couple of compilations of 7in records I bought in Kenya in the early 1980s on Matt Temple’s excellent Matsuli blog. I can’t thank him enough for starting me off on another journey and introducing me to new friends along the way. 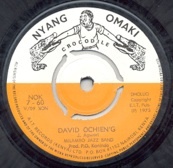 Welcome, here you will find details of music released on 45rpm discs from the time of Kenya and Tanzania’s independence until the arrival of the cassette and CD killed the single. 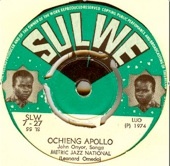 The listings include records by pioneers of Kenyan music Daudi Kabaka and Fadhili William, benga wizards DO Misiani and Victoria Kings, Kamba legends like Kakai Kilonzo and the Kilimambogo Brothers and Kikuyu ones like Joseph Kamaru, top Tanzanian bands Orch Super Volcano and Nuta Jazz, kings of Swahili pop Les Wanyika, giants of Congolese rumba Franco and TPOK Jazz and Tabu Ley Rochereau as well as the Congolese bands such as Orch Super Mazembe, Orch Shika Shika and Les Kinois who moved east in search of fame and fortune. The reasons for attempting such a mammoth task are that I love the music and want to know more. Had I been interested in, say, Dutch psychedelia 1969-72, the internet would have offered a wealth of information. Yet, as far as I know, nobody has tried so far to build up a picture of East Africa’s incredibly vibrant recording scene of the time. This is an attempt at rectifying that situation.